Art’s Emotions is published in North America by McGill-Queens University Press, and in the rest of the world by Acumen Publishing. To read about the book on the publisher’s website, click here. To read a review in the Notre Dame Philosophical Reviews, click here. Despite the very obvious differences between looking at Manet’s Woman with a Parrot and listening to Elgar’s Cello Concerto, both experiences provoke similar questions in the thoughtful aesthete: Why does the painting seem to express reverie and the music, nostalgia? How do we experience the reverie and nostalgia in such works of art? Why do we find these experiences rewarding in similar ways? Our awareness of emotion in art, and our engagement with art’s emotions, is something that many an aesthete will tell you makes a special contribution to their life. So it is timely for a philosopher to strive to account for the nature and significance of the experience of art’s emotions. 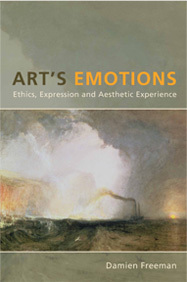 In Art’s Emotions, Freeman develops a new theory of emotion that is suitable for resolving key questions in aesthetics. He then reviews and evaluates three existing approaches to artistic expression, and proposes a new approach to the emotional experience of art that draws on the strengths of the existing approaches. Finally, he seeks to establish the ethical significance of this emotional experience of art for human flourishing. Freeman challenges the reader not only to consider how art engages with emotion, but how we should connect up our answers to questions concerning the nature and value of the experiences offered by works of art. To read Peter Avery’s obituary in The Guardian, click here.